Hello friends! Welcome back to a new week and thanks for starting yours here with me! I hope you had a great weekend. Ours was full of baseball on Saturday with the opening ceremonies, carnival day and then afternoon game. It was a long day and Jordan played so hard she pooped out at 6pm! Sunday we went to Ali-Shaun’s house for the Hespera Trunk Show. The owner and designer, Eric, is an absolute sweetheart and he makes stunning stone jewelry that was been seen on Miley Cyrus, Superwoman and Game of Thrones. Erik and I are planning a GIVEAWAY for you soon, so stayed tuned for that! And if you were watching my Stories, here’s what Ali-Shaun was wearing on Saturday. A lot of you asked if it was a baby carrier! 😉 It’s actually a scarf you can wear multiple ways, currently $29, normally $48! Speaking of GIVEAWAYS, my March giveaway ends soon! I’m giving away three $100 gift cards to Target, one of my March Loves (your choice), AND a Get Fit Done Guide! All you have to do to enter is follow me on Instagram and LIKE all of my March posts! #easypeasy! This is a way for me to give back to ♥ YOU ♥ & help me grow my Instagram with the crazy algorithm that keeps y’all from seeing my posts! Thank you SO much for following along with me there! Today I’m back with one of your faves, a new Amazon fashion haul! Y’all seem to really like these posts and I know why! Amazon has some real fashion gems hidden among the paper towels and dog food! I dig and dig and over order and then share the best pieces with you here! For Size Reference: I’m a shorty (5’1) and petite, athletic build (bigger legs), weighing about 110 and wear a 34D bra. I typically wear size 0p/25 jeans, XSP in tops and dresses. Lots of times the smallest size on Amazon is a Small, so in that case, that’s what I ordered. Okay, now onto the fun stuff. Let’s jump into this Amazon clothing haul! AND, see a LIVE try-on saved to my Instagram Story Highlights soon! 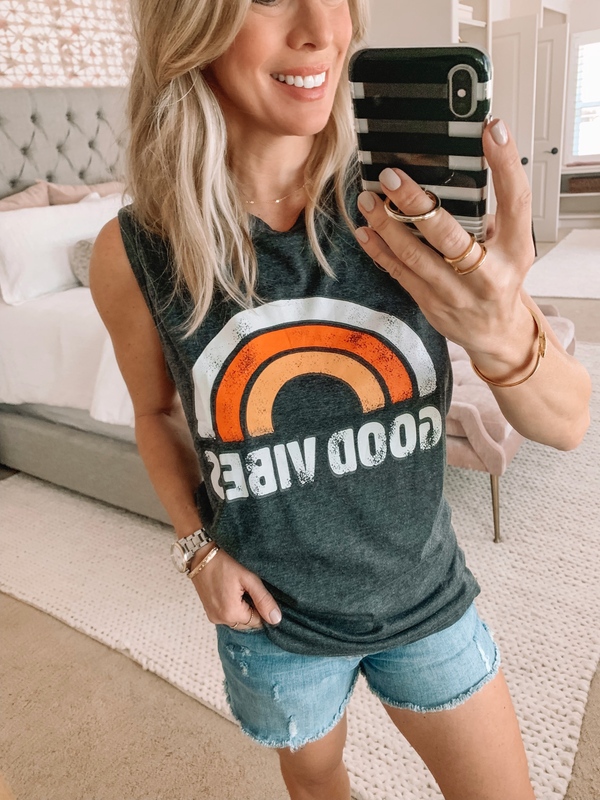 I’m getting all the good Summer vibes in this Good Vibes tank! 😉 It’s weekend casual at it’s best, especially with these slightly distressed jean shorts. The shorts are high waisted and a nice, light wash with a raw edge hem. I’m been curious about the kimono trend and found this one with a darling black and white elephant and paisley pattern. It’s an easy lightweight layer to add to your outfit weather you’re wearing shorts, jeans or even a swimsuit. It’s only $15! I particularly liked the mid-thigh length on this one for starters, but I’m looking for longer ones now. See how cute it is over a swimsuit?! 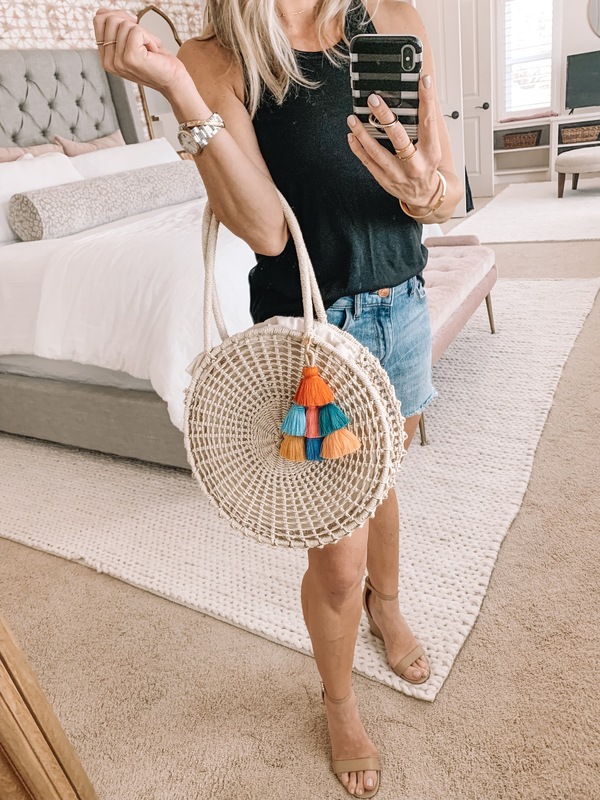 It’s funny how you can get such a thrill over something as small as a tassel accessory! This one is so fun and adds a vibrant punch of personality to an otherwise plain bag. You can choose your colors of choice, but I warn you, it’s hard to decide! 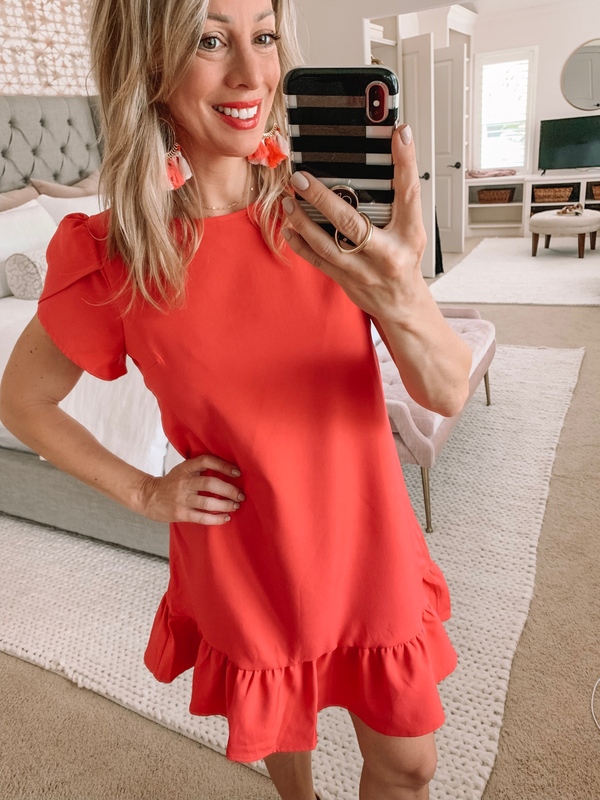 The tassel is really well made and only $8 with Prime shipping! 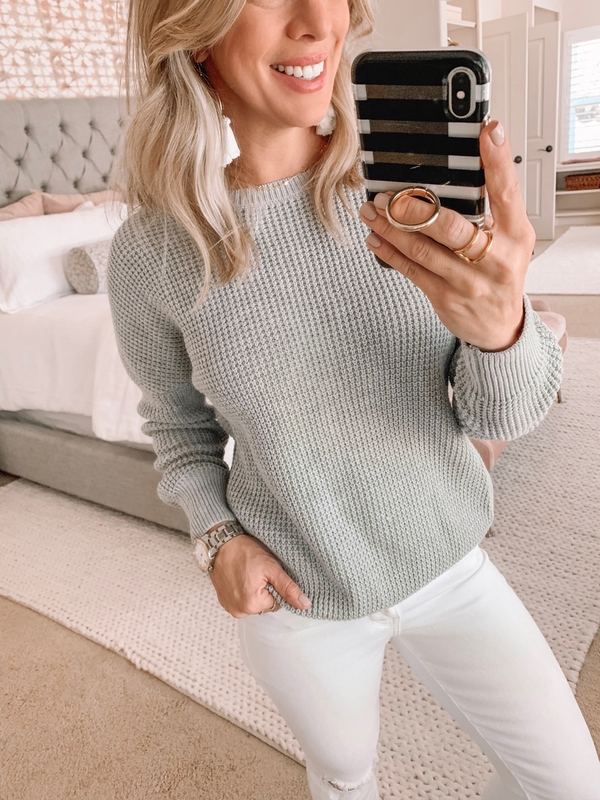 We’re still having our fair share of chilly mornings and evenings, and I fell in love with this grey cable knit sweater. You have to see the cute criss cross back. 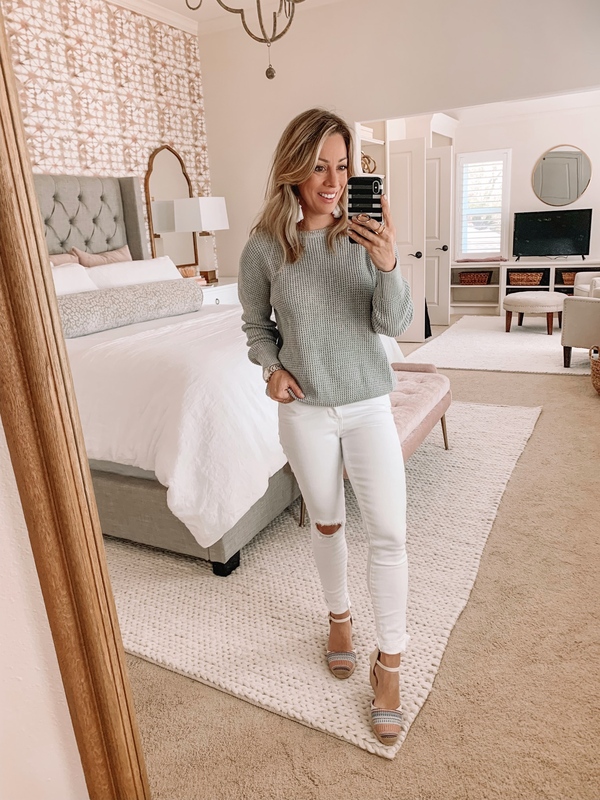 It looks great with white jeans, and will also be great with your jean shorts this summer! 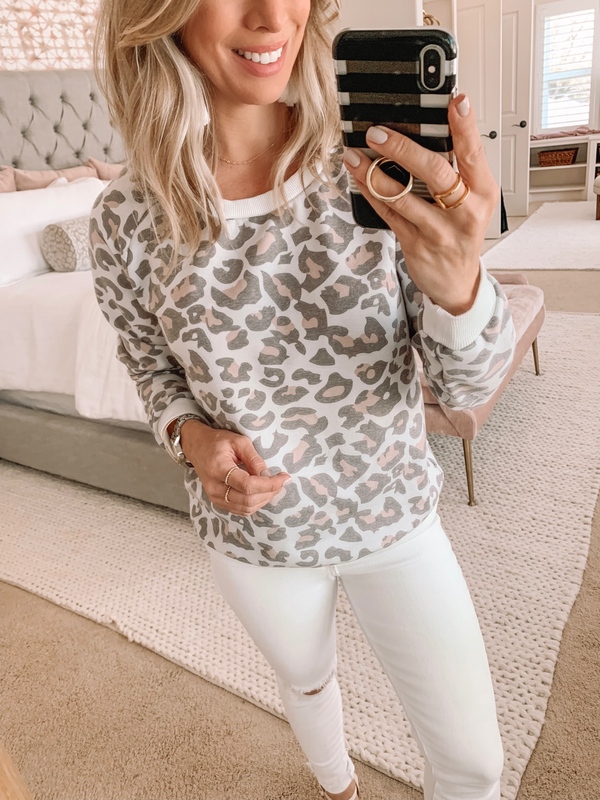 This leopard print sweatshirt arrived just before we went out of town for Spring Break and I found myself wearing it so much! It’s a thin knit and comes in several colors- I’m wearing ‘Camel’. FIT : Wearing size Small, size up for a slouchy fit. There were several hits in the dress department too! Doesn’t this maxi dress make you want to go on vacation?! It does for me! I like the dark background against the coral and white flowers. The skirt has a front slit and it’s backless, so you have to forego a bra or wear pasties! These breast petals are 3 for $6 with great reviews. 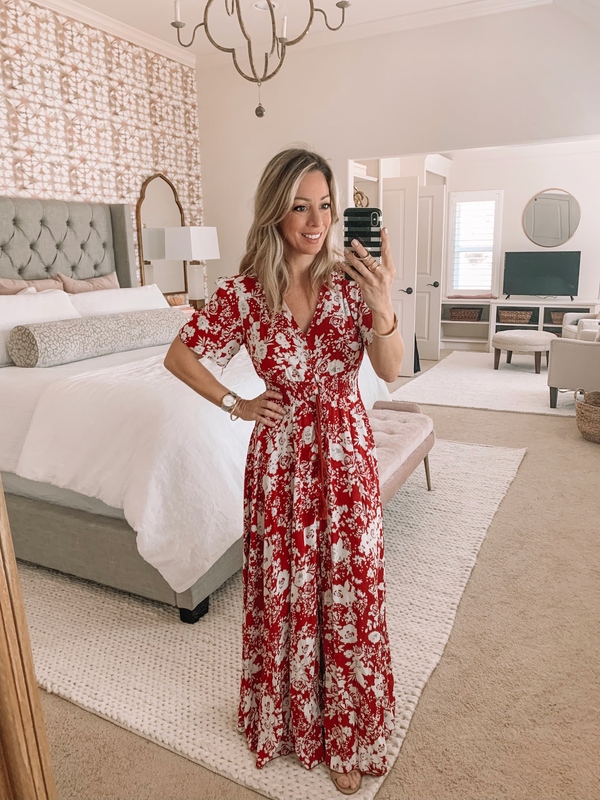 There are 3,100 positive reviews on this gorgeous maxi dress and I’m adding another 5 star rating! It’s so beautiful and flowy and buttons all the way down. You can leave a few bottom buttons undone to show a bit more leg. It’s not sheer or see through at all and I’m happy to be bringing it out again! FIT: TTS, wearing size XS. On the model, it’s more of a midi fit. But on me (5’1) it fits right to the floor and I could wear it with heels without having to alter it. This button front dress had me from the minute I saw it online and I’m so glad it’s as good in person! With short sleeves and a drop hem, it’s perfect for work to weekend and everything in between. The relaxed fit is very forgiving and easy to wear. Again, lots of colors to choose from in this one! I was really impressed with the quality and feel of this dress for only $22! It feels nice and silky on as opposed to rough or textured. The slightly puffed and criss cross sleeve is really cute along with the ruffled hem. It’s very forgiving with an A-line shape, but also on the short side. It comes in 12 colors. 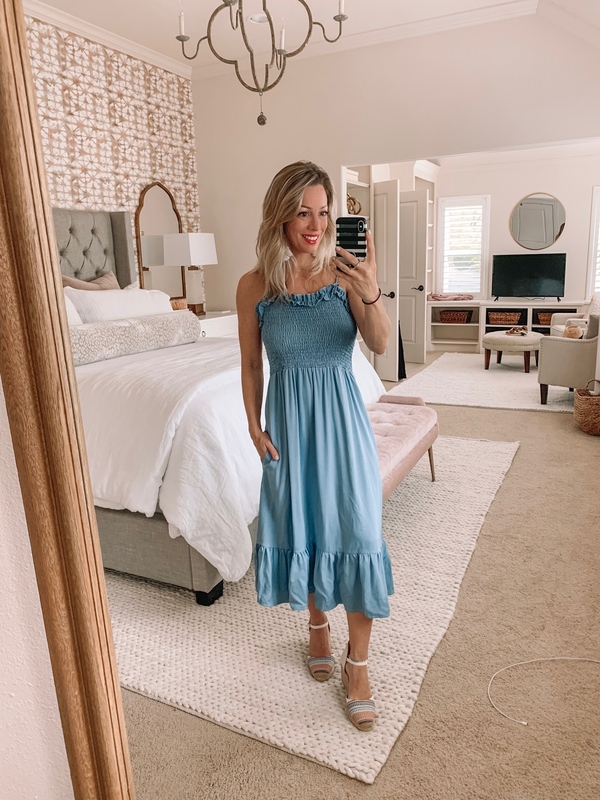 I was also a fan of this sundress that would easily take you to weekend brunch or get together with friends. It’s got thicker adjustable straps, a smocked bodice, sweetheart neckline and tie waist (that I think I missed when I unwrapped!) #oops! Similarly, this striped tank dress can easily be dressed up or down, depending on the occasion. It’s fully lined and feels nice and lightweight on with a non-body conscious fit. These next two casual dresses are perfect for throwing on then running errands or just hanging out. They have a lot of stretch and a good poly/cotton blend material. And pockets! I might like the maxi style even more! Both would look great with a jean jacket on top too! If you like the look of a shorts romper, but want one that’s not too short, this is a great option. The shorts are on the longer side, but the whole look is still flattering. I like how the sleeves are capped and that the drawstring waist allows you to blouse the top. Bonus: it has pockets and is under $19! If you prefer, it comes in solids. This is one of my favorite outfits in the whole bunch! It’s a one-shoulder shorts romper that is actually quite stunning in person! I love the way the top fits and how it’s cut to hang over the waistline. The shorts are also flattering and so comfortable. I’d wear this to a daytime Summer party or for a night out! I know lots of you are always looking for more clothes you can wear to work and I think this sheath dress would be an option. It’s a thick, stretchy material that moves easily when you walk and it ties in the back (or front). After work, you can head straight to happy hour or dinner. Oh man, if only this jumpsuit wasn’t way too big on me! I still liked it so much that I wanted to share it with you in case it would work for you! It’s a racerback tank style that blouses over a very comfortable elastic waist. You can wear a strapless bra without it showing. Jumpsuit FIT : Very long, wearing size Small. 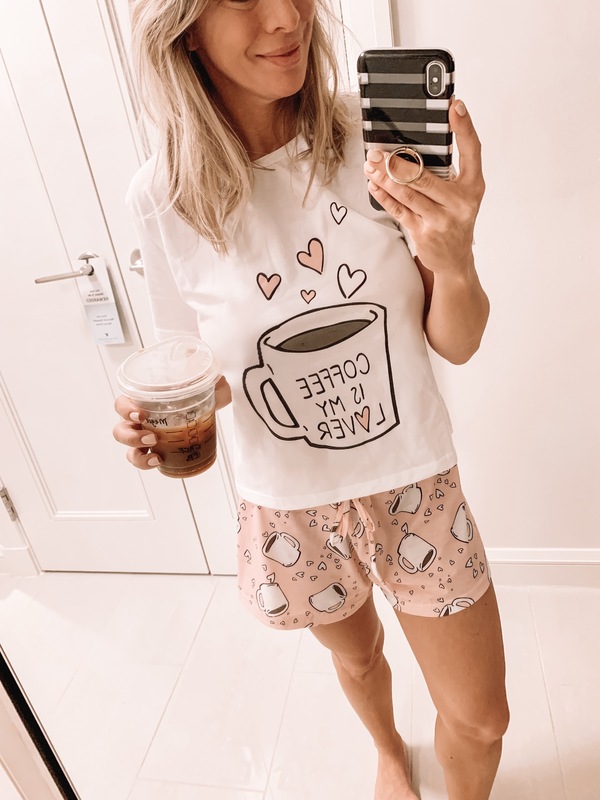 I shared a huge round up of swimsuits last week, but there are lots of great ones on Amazon too! 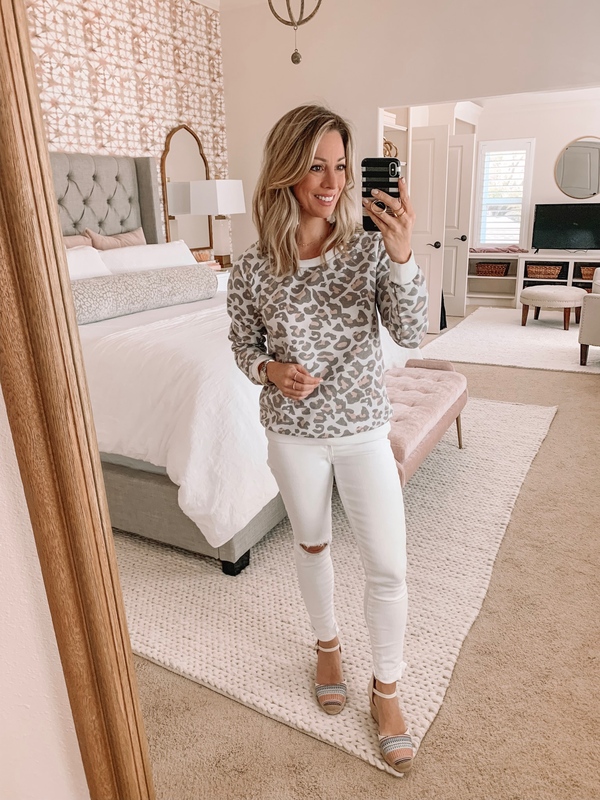 This suit is so, so cute and luckily arrived just in time for our Spring Break trip! I’m a huge fan of a rash guard so I was definitely intrigued when I saw this swimsuit. I don’t think I’ve ever had a short sleeve suit but I actually love this one! The pattern is really fun and different and even though it’s short sleeve and modestly cut on the thighs, I didn’t feel frumpy in it. I think that’s partially due to the way the pattern accentuates your figure. You can wear the zipper more open if you want to, but I like how it looks zipped up. I also found a rash guard that doubles as a cover up minidress. 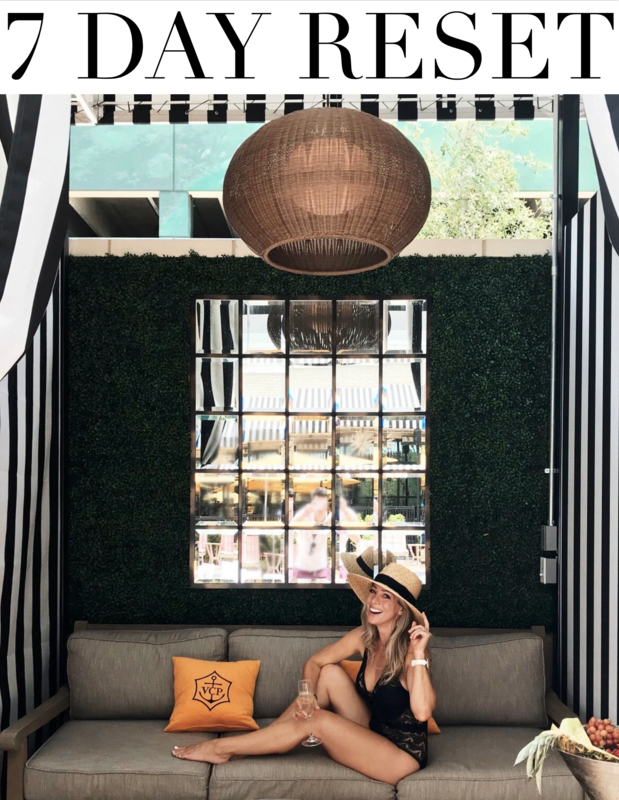 It will help protect you from the sun and I always appreciate that after a long day at the pool or beach or on Day 2, when you’ve already gotten enough sun. It’s also great when the weather is windy and you want sleeves. The material is quick dry and nice and stretchy. To convert it into a top, simply pull the side strings and voila, you have a top at whatever length you want! And you can also adjust the zippered chest. No wonder this top has over 1,200 positive reviews! You might have already seen me in this since this picture is from Spring Break. I love the sentiment since it pretty much sums up my life! 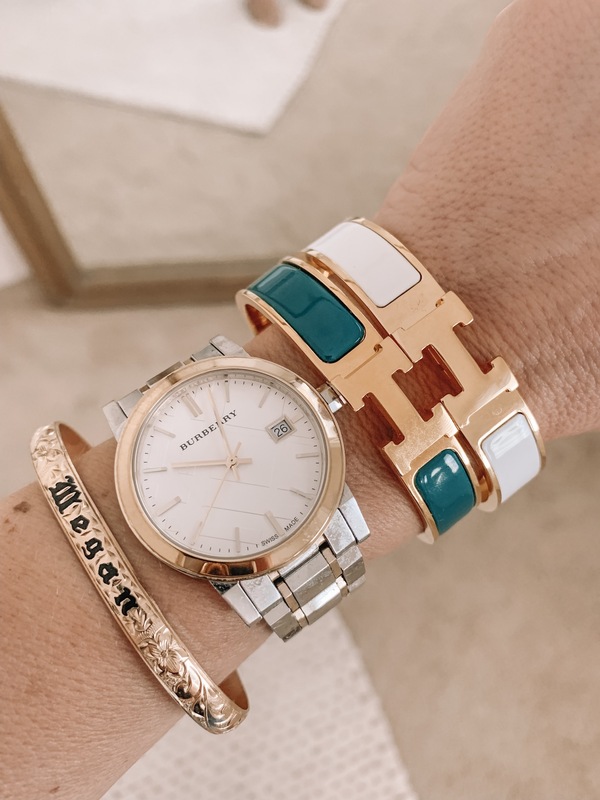 Last but not least, I’ve been so curious about the dupe H bracelet I’ve seen on Amazon. Would you be able to tell which one above is real and which one isn’t? I’ve been gifted a couple of authentic H bracelets, but I’m actually really happy with the inexpensive dupe! It literally looks nearly identical! The only discernible difference is that the clasp doesn’t open as easily on the dupe. I struggled a bit with it, but other than that, it’s really gorgeous and I like it so much, I got it in both black and white. How could you not at under $15?! Okay friends, I’ll wrap it up here and send you off with warm wishes for a wonderful week ahead! Did you have a favorite item this time? I’d love to hear what you want me to search for next! Just ordered the ruffle hem dress in the lavender color!! Can’t wait to try it! I’ve been looking at quite a few of these items but always am skeptical until I see someone wearing it in real life. I definitely want that striped maxi dress + the Good Vibes tank now. Thanks so much for sharing! I know what you mean! Sometimes you get a hit, and sometimes a miss! So glad this post was helpful! Love the hat, elephant kimono, and that one shoulder romper! All three are on my summer beach trip wishist. I have the good vibes tank and it’s a favorite for sure! Cheers Virginia! I bet I’ll be wearing this all Spring and Summer long! This was a GREAT haul! Love the Good Vibes and that one shoulder romper. On it’s way to me! I have been looking at a few of these over the past few weeks, your review sealed the deal. Thank you for taking the time to talk about each piece in detail. I’m so glad this post was helpful Lindsey! I liked this one! Love your phone case! Where is it from? I just ordered the kimono. Love kimonos over sleeveless tops and dresses, arm flab yuck! Plus being a “Bama fan” love the elephants. Would love the red/white maxi, but I can’t do backless. Wasn’t blessed with enough up top. Ha. Love this haul.. Several items I added to my cart. Where did you get the bracelet with your name.. It ‘s beautiful.. Have a great day. Hi Kim! Thanks so much, that bracelet was a special gift from my Grandma Nola. It’s from Hawaii- traditional Hawaiian jewelry. She had one too! Thanks so much for that Elizabeth, that’s my goal to make it helpful for you! Do you have to wear a bikini top or something supportive under the suit, or is an all-in-one rashguard suit? thanks! Hi Erin, it’s got removable padded cups! All in one suit! Thank you thank you for showing all of these great finds!! I bought the hat already and just added other stuff to my cart. I can only imagine how much work goes into this so a million thx! Hey Vivian, how are you?! These posts are a labor of love, but lots of things from Amazon are quickly becoming my faves! I ordered the H bracelet and it just arrived. It looks great but I can’t figure out how the clasp works. Can you offer amy suggestions? I don’t want to return it because the quality is so good AND I have a second one in black coming soon. Hi Karen! Great question – it is a little tricky! You can squeeze the band together and then slide one side of the H out. 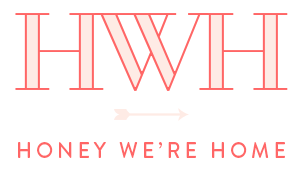 If you look under the H, slide the part that doesn’t have the hinge. Let me know if that works for you! 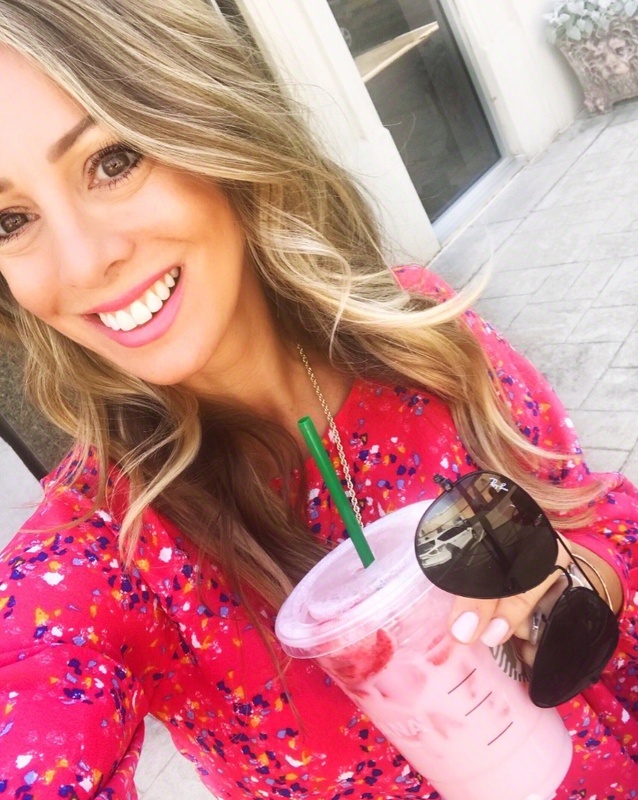 Just came across your blog a few days ago and I absolutely love it. You’re outfits and taste in style are awesome. I also love your fitness section. I meal prep every Sunday evening and your blog has given me great inspiration. Thanks! Hi Kayla! I’m so glad you found me! 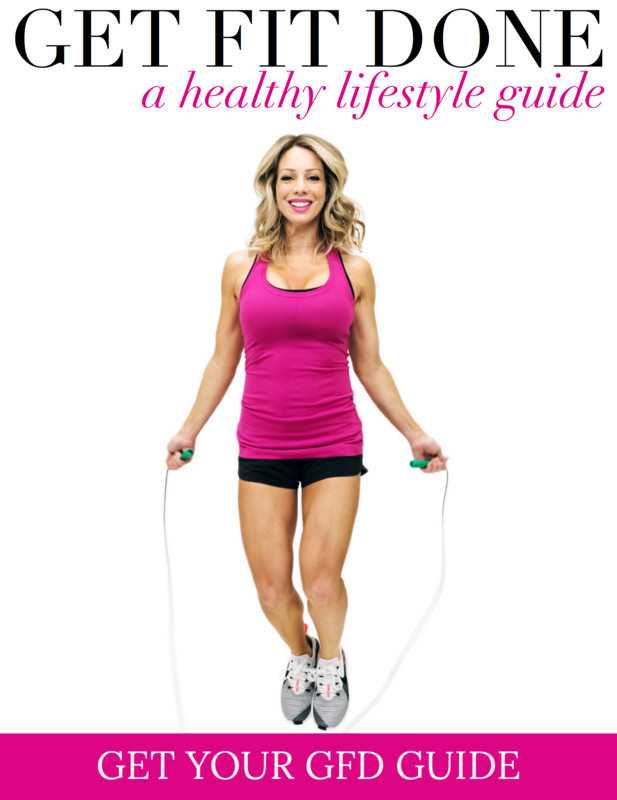 I’m super passionate about fitness, and more importantly, feeling good inside our bodies! It’s all about strength and energy and positivity! Here’s to that! What a great haul Megan! Appreciate all the work you put into this. It’s so helpful. You’re the Best! Hi Mary! I appreciate you taking the time to comment so much! Thank you! I also just recently discovered your blog!! How exciting for me as I am 5′ 2″ and weigh 109 pounds so I can finally have a real live model who has great taste and fashion sense to model clothing for me!! Ha ha. Also the fact that I’m usually an extra small in tops is sometimes challenging. I live in Florida and am always looking for short sleeve tops that have some personality to them. I recently started looking for a nice white shoulder bag or tote for spring and summer and I’m not having much luck. I’m not really looking for a leather one because I have way too many handbags already. Like who doesn’t right. That’s so awesome Jo (my mom’s name too!) 😉 I’m in Houston, so our weather is similar! I’ll keep my eye out for those bags! I’m happy to hear what else you’d like to see!